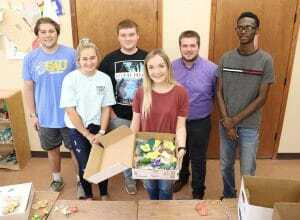 Just like enrollment at Southern Arkansas University, volunteer efforts for the community also skyrocketed this past fall along with SAU learning it again earned a spot on the President’s Higher Education Community Service Honor Roll with Distinction. “Community service is an integral part of the student experience at SAU,” said Dr. Donna Allen, vice president for student affairs. 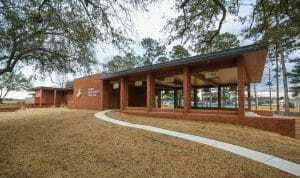 “SAU has been selected to the President’s Honor Roll or Honor Roll with Distinction from 2008 to the present. Every year, our students learn the importance of serving in their communities.” In 2012 and 2013, SAU was on the coveted “Distinguished” list – the only university in Arkansas each time. For the 2015 awards, which were announced on Sept. 23, 2016, SAU was joined on the Distinction list by only one other university in Arkansas – Harding. SAU was honored in three of the four Honor Roll categories–Education, Economic and Institutional Commitment to Service. More than 340,000 hours of community service and academic service learning were documented in the 2015 entry, which contained activities from the 2013-14 school year. 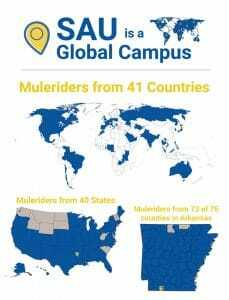 Several wide-reaching initiatives were highlighted, including the SAU Cheerleaders helping with tornado cleanup in Moore, Oklahoma, Mulerider Athletics’ popular “Muleriders in Magnolia” program, and the Angel Tree being hosted at SAU. Also featured were academically-inspired work, such as S.A.K.E. and electronic waste disposal from the Rankin College of Business and projects completed by groups in the College of Behavioral and Social Sciences. Since the President’s Community Service Honor Roll recognizes work done in the year previous to each entry, more recent initiatives such as Making Magnolia Blossom and Mulerider Kids College have yet to be considered for SAU, according to Taylor. 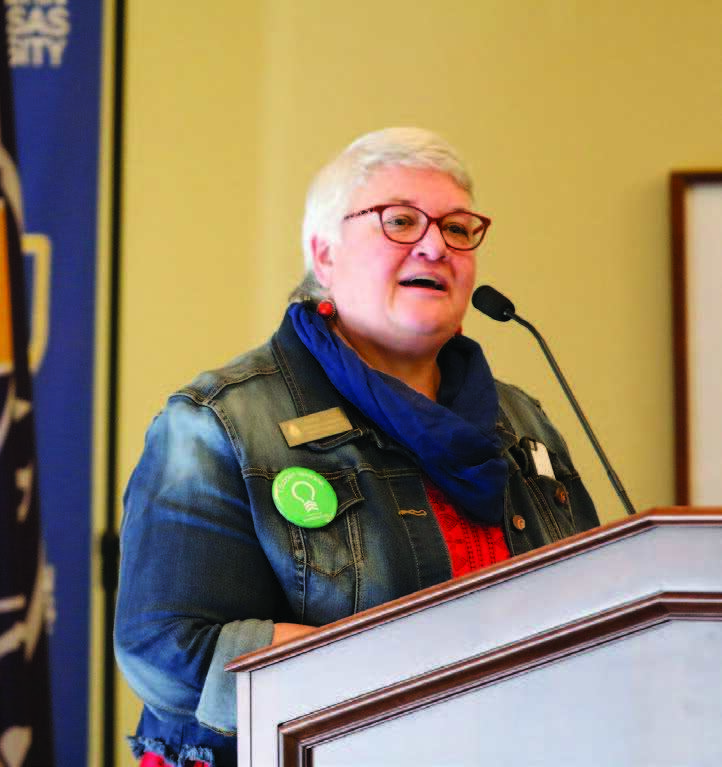 Taylor also outlined volunteer efforts from this record-setting fall semester at SAU, which have opened the door for even more students to get involved in bettering the community. And she said the community has taken more notice than ever before of SAU as a resource for volunteer help. One of Taylor’s favorite anecdotes from this fall was how people from across campus stepped up when the local Upward Basketball league needed five coaches – more than 20 people responded and offered to help. They were able to fill all their coaching and assistant coaching positions. She’s also been impressed by student leaders who have overseen volunteer events if she was not able to attend. Students headed up the large volunteer efforts at the cross country Lois Davis Invitational and the annual Magnolia Specialized Services Fishing Derby at SAU. Student leadership and large numbers of nightly student volunteers played a huge role in the success of the H&P Animal Alliance Haunted House, according to Taylor. Some other area events where students assisted included the H&P Animal Alliance Haunted House, the Columbia County Fair, several campus cleanup events, preparing flood buckets for Louisiana, decorating Wilson Memorial Garden for Christmas, helping at the Fall Fest on the Magnolia Square, and helping run a benefit fish fry for Southern Christian Mission. Some students this fall even initiated and completed new community projects on their own. Brandyn Atwood, a freshman computer science major from Camden, organized and ran a campus-wide video game tournament in October to raise money for toys to donate to the Arkansas Children’s Hospital (ACH). He approached Taylor with the idea, receiving some insight from her experience with community events, planned all aspects of the event and saw it through to completion. The tournament raised more than $200. Atwood and other students shopped for toys. Added to their efforts were a large number of toys donated by Temple Baptist Church in Camden. Atwood and his team delivered the toys to Little Rock on December 4. They were able to gift ACH with nearly $450 in toys. Taylor said that some of the practices that worked this fall for getting more students involved in volunteering included briefing Freshman Seminar classes on potential service opportunities and using social media platforms to extend the reach of event information, organizing an on-call student volunteer team for unexpected calls for help, offering transportation to students to get to volunteer projects, and random acts of kindness initiatives, also started by student leadership. To find out more about SAU’s community service efforts or how you or your organization can get assistance from SAU’s growing team of student volunteers, contact Taylor at (870) 235-4922 or DeanaTaylor@saumag.edu.